Bright, Leonard K., et al. “Methacrylate Polymer Scaffolding Enhances the Stability of Suspended Lipid Bilayers for Ion Channel Recordings and Biosensor Development.” ACS biomaterials science & engineering 1.10 (2015): 955-963. Gallagher, Elyssia S., Elisabeth Mansfield, and Craig A. Aspinwall. 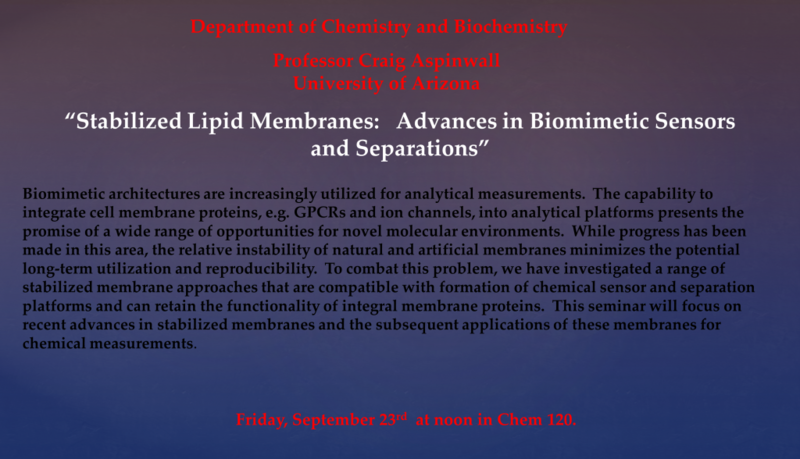 “Stabilized phospholipid membranes in chromatography: toward membrane protein-functionalized stationary phases.” Analytical and bioanalytical chemistry 406.9-10 (2014): 2223-2229. Heitz, Benjamin A., et al. “Fractional polymerization of a suspended planar bilayer creates a fluid, highly stable membrane for ion channel recordings.” Journal of the American Chemical Society 132.20 (2010): 7086-7093.